Gluten Free Slow Cooker Raspberry Pork Radicchio Wraps. 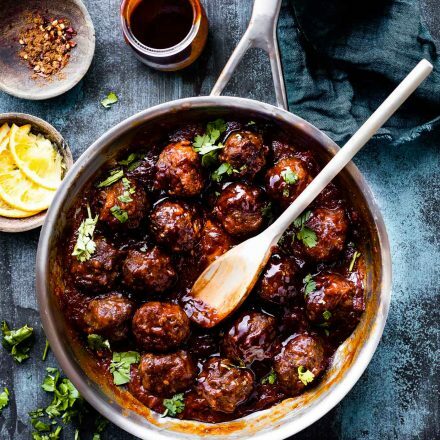 Sounds fancy but it’s such an easy recipe to make and serve in the slow cooker! A flavorful healthy dish your whole family will love! 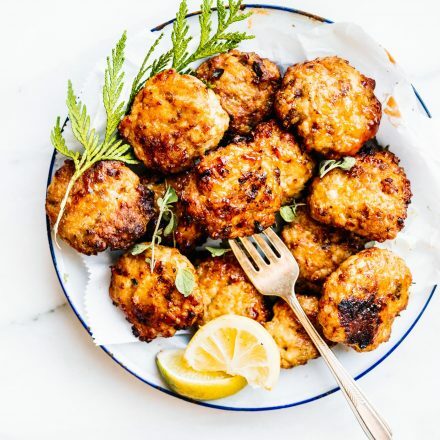 Great for a meal or a gluten free appetizer. Another NEW vegetable to try this week. Apparently I’m already over Summer and moving on to Fall/Winter vegetables. Actually, this vegetable (Radicchio) is pretty much available year around. And the other flavors I’m combining with it have a touch of Summer. It all evens out, right? But hear me out. I have a reason for this recipe. Like always, there is a nutrition focus. Because food is just so much better when we “get it.” We get why flavors work, why nutrients collaborate, why recipes are cooked a certain way. When we GET our food, it GIVES right back. Taste and nourishment! Sorry, corny Cotter moment. Okay, let’s talk about this dish. First of all, it’s super easy. Don’t let the long name (slow cooked, gluten free, raspberry pork, radicchio wraps, etc.) intimidate you. It really is simple and purposeful, just needs to be explained. Ready? What’s the dish and WHY! slow cooker or stewed Pork (meat) – slow cooking meats at lower temperature help us digest it better. Raspberries/ Juice – A summer fruit that is high in vitamin C, which can help with power within the dish. Plus it helps balance out the spicy radicchio. Goat Cheese – Healthy fats and Calcium. Plus goat milk is also easier to digest that regular cow’s milk due to a low lactose content. Radicchio– The star of the show! This vegetable makes for a great alternative for regular wraps. It It has a bitter and spicy taste which is why the goat cheese and raspberry make a great pair with it! 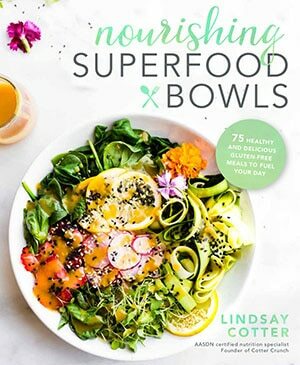 Also, radicchio is shown to promote digestive juices secreted from liver to gallbladder, which improves your overall digestion, especially with healthy fats. I was going to mention the real name of this, but decided to not give a visual. Haha. Feel free to read about it here. Oh, and I added shrimp on top to a few, for a little surf and turf fun, but it’s totally optional! So to sum it up. This dish is EASY to make in the slow cooker and EASY on the stomach. Which is why we’re totally diggin it! When life feels like a roller coaster, it’s always nice to focus on the simple things. Including food and nutrition. 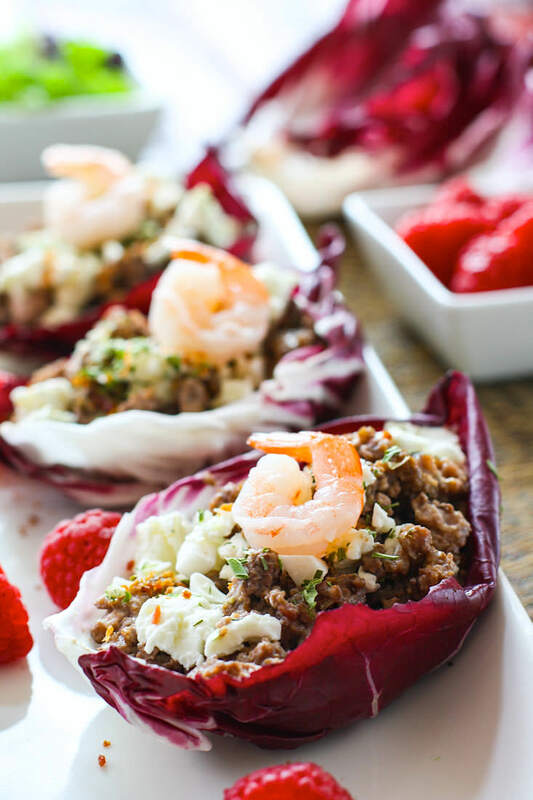 Gluten Free Slow Cooker Raspberry Pork Radicchio Wraps. Sounds fancy but it’s such an easy recipe to make and serve in the slow cooker! A flavorful healthy dish your whole family will love! Add all your ingredients to the crock pot and mix well. Place on low for 2 hrs. Stir about 1 hr and half through. Drain any extra grease from pork. Add in a few tablespoons of creamy balsamic dressing and a pinch (about 1/4 tsp each) of black pepper and sea salt. Cook on high for another hour or less. Or low until pork looks done. Shouldn’t take more than 3 hrs total. 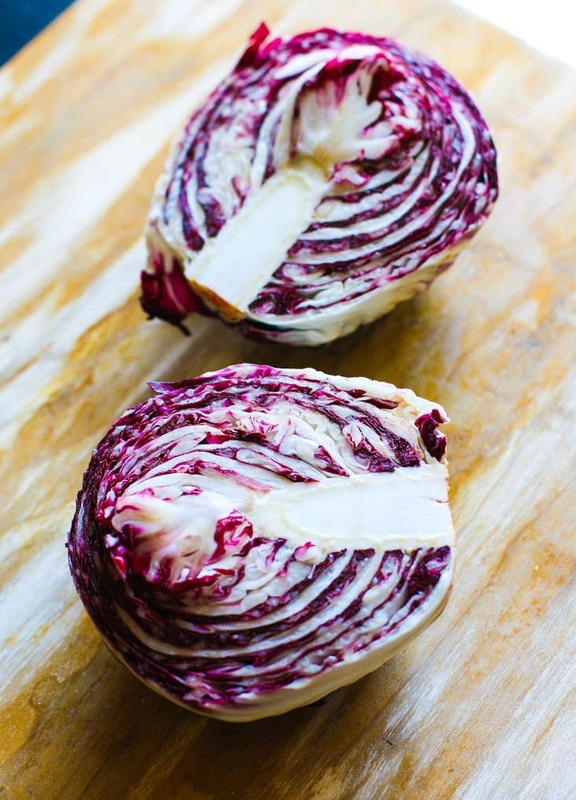 Slice your radicchio cups into wedges. Pull apart to makes cups or wraps. Spoon pork into each wrap, drizzle with any leftover juice from slow cooker and then top with goat cheese and dried herbs. Feel free to add any other toppings like shrimp or bacon. I also like to add a little more creamy balsamic dressing on top to even out the spice of the radicchio. What I also like about this dish is that you don’t have to use pork. You can use chicken, turkey, tempeh, salmon, beef, etc. All will work beautifully in the recipe. Slow cooked with the raspberry really makes it flavorful! 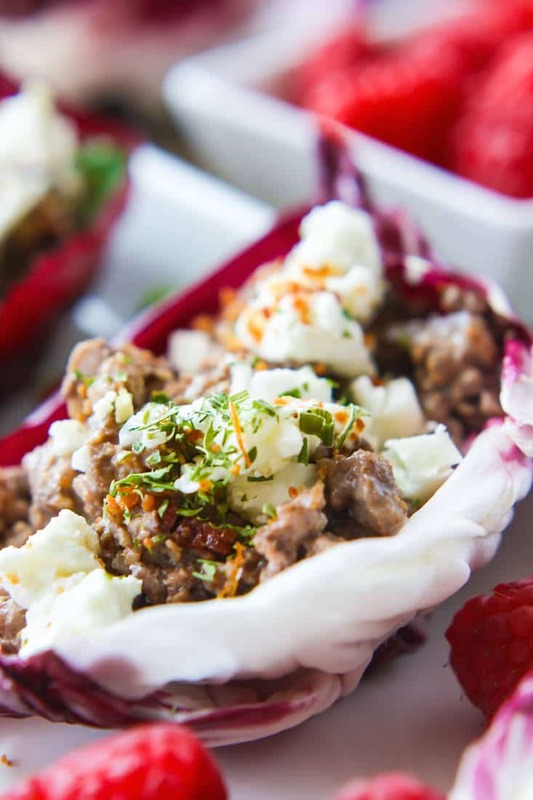 The radicchio cups are my frugal way of eating gluten free but with great great health perks. It’s truly a win win, don’t you think? And if you if you have time, you should try grilling the radicchio first. It’s AMAZING! oh the goat cheese.. it’s my fav! Don’t ever forget that. Okay, try this out and let me know whatcha think! 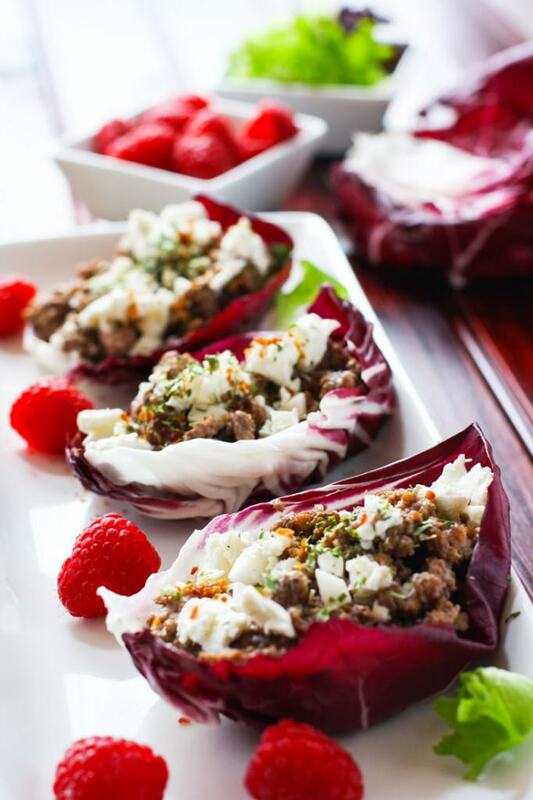 Have you tried radicchio cups? Yay or nay? 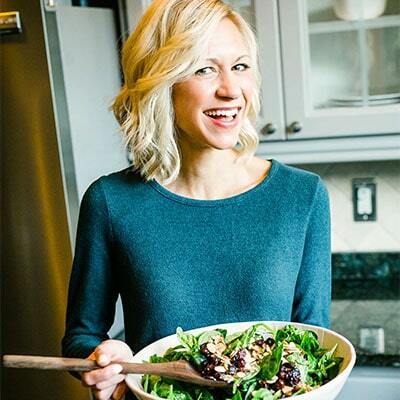 ← Easy Grain Free Trail Mix Blondies – Simple and Delicious! 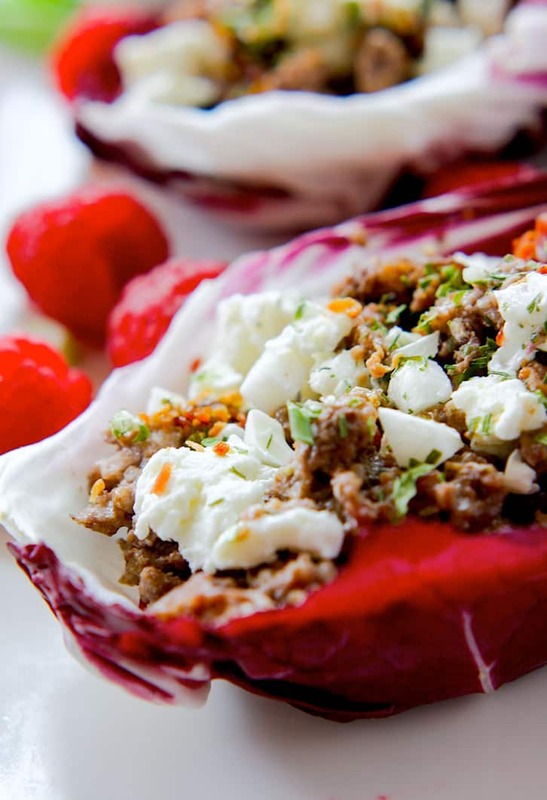 Pork plus goat cheese means this is a must try for me! I haven’t used my slow cooker enough recently. are you the first ever to come up with the raddicco (sp :-)) wraps?? this is such a fantastic idea!!! haha i’m not the first but I’ll take credit for being frugal and lazy in the gluten free department. I’m loving these new vegetables! I’ve seen radicchio before but never cooked with it… oh and any goat cheese is delicious in my book. Goat cheese for dayzzzzzz please! Your recipes never disappoint! I think my boyfriend Joe might even be willing to try this one (he isn’t very adventurous with food). Thanks so much for sharing! I’m not a big radicchio fan, to be honest. The bitterness really reacts on my palate (I’m not big into bitter in general). I don’t mind grilled radicchio as much, but still, it and endive are not my faves. but it’s so good for your tummy! haha I know, it’s spicy. 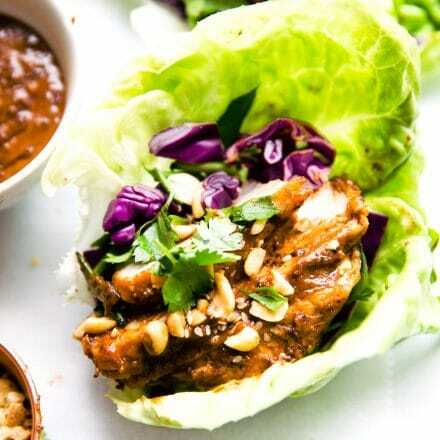 But you can easily just use lettuce wraps. ANYTHING for my SUZ! Those are probably the BEST and PRETTIEST lettuce wraps that I have ever seen. That slow cooker pork filling would be marvelous to fill some pita pockets too. haha you are too kind! and yes, they would be GREAT in pita! YUM! These sound amazing and I’m not a pork person! Such beautiful colors too Lindsay!!! These do sound fancy! Girl you have the most creative recipes and they always look so delicious! The only way I can eat raddichio is if it is grilled. Even in salad mixes, I pick it out or have to make sure to use a lot of dressing to cover the flavor. Haha well when you add the raspberry and goat cheese it evens out the spice and bitterness. And then I added more dressing on top. I bet grilling it first would rock! I love this! I’ve done collard wraps, endive boats… but never a raddichio wrap! Totally trying it. I’m sure Vegas will thank you. The raspberry and pork combo sounds amazing! Love using vegetables as wraps! Mmmmm goat cheese is DELISH! I haven’t had it in a while. I’ve never had these before, but I definitely would try them if you made them for me…LOL…Hope you’re staying sane and cool busy lady! Radicchio is my favorite & I haven’t had it a long time! I may have to make this dish, but with chicken. PS love that you added some shrimp. Yum! i just had too! love that shrimp! i know, right? SO GOOD that combo! These sound incredible! Ryan loves pulled pork and this is a healthier and fun alternative to tacos or sandwiches. And goat cheese? It’s everything. I think I could give up all other cheeses and subsist on goat cheese. Oh, I always use lettuce to wrap. What a fun way to switch it up. Um, yes PLEASE!! These sound incredible! First of all, they’re beautiful. Second, the slow cooker is my life saver. 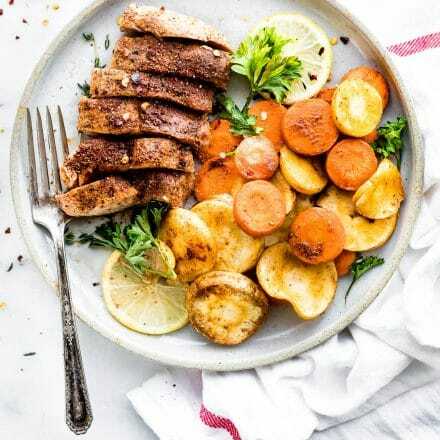 Whether it’s a busy night with the kids, or an evening of entertaining, I never have the chance to stand over the stove and micromanage my meal. These are such a great solution, and I bet they taste amazing. Pinned! Your bold pictures are great! Oh my these look good! I’ve never had radicchio wraps before! Pork and raspberry flavor – crazy creative!!! I love the idea of lettuce cups. And corny Cotter moments. I love the idea of using the radicchio as cups. Genius. I’ve been using collards for wraps lately so I’m right there with you when it comes to unusual serving vehicles. Saw these on insta after getting back from the CANADA, and I immediately fell in love. Can’t wait to give these a try! This recipe just popped up on my FB feed. It looks delicious and I look forward to making. One question – am I missing a recipe for creamy balsamic dressing? Is it a bottled dressing or do you have your own recipe ? Just curious what you use to make it creamy. Thank you.